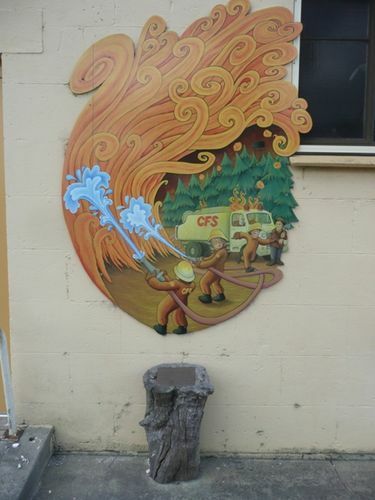 A mural commemorates the 25th anniversary of the Ash Wednesday bushfires of 1983. The Ash Wednesday bushfires, known in South Australia as Ash Wednesday II, were a series of bushfires that occurred in south-eastern Australia on 16 February 1983, which was Ash Wednesday in the Christian calendar. Within twelve hours, more than 180 fires fanned by winds of up to 110 kilometres per hour caused widespread destruction across the states of Victoria and South Australia.Years of severe drought and extreme weather combined to create one of Australia's worst fire days in a century. The fires became the deadliest bushfire in Australian history, until the Black Saturday bushfires in 2009. In the space of a few hours in South Australia, 28 people died, 14 in the Hills and another 14 in the south-east. Three CFS volunteers were among the dead. More than 300 homes were lost along with a hotel, a service station and 13 historic buildings.